Down & Dirty: What's it like? I know it's hard work, but the rewards are great! I'd have loved to seen the dancing and gardening show. That is an incredible shot of the bee in flight. I was out doing a garden client in that 90+ weather, too. Whew! Fine for August, but April?! 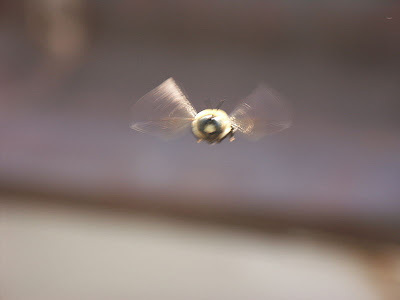 Good to know about the male Carpenter bees. Thanks Domino, the rewards are indeed great and it's so nice when the work is also play. Keewee, I wish I'd taken that shot but alas, it's the only one I DIDN'T take! I don't think I could have stood still long enough to focus on the bee. Leda, I was back on the terrace today, armed with my new knowledge...but no sign of the stingerless bee! Thanks so much for dropping by to let me know about my fiddlehead fern misidentification. I will definitely give fiddleheads another try, once I figure out where some tastier bracken or ostrich ferns are. That bee photo is to DIE for!